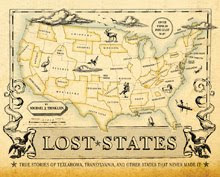 Disaffected Democrats in the Tucson area launched a web site today for their group "Start Our State"—to rally support for the creation of the 51st state from portions of southern Arizona. The idea springs from the reality that Southern Arizona leans Democrat... while the more-populous Phoenix area leans Republican. So if you can't get your way in the state legislature, you create a new state! The U.S. Constitution offers a roadmap to make this happen. But I think the protesters in Arizona are thinking too small. Why not hook up with the Democratic-leaning counties in New Mexico and Texas? The map above does just that, creating a Democratic stronghold that would make any professional gerrymanderer proud. Since it covers three states, the oft-proposed name of Baja Arizona won't do. 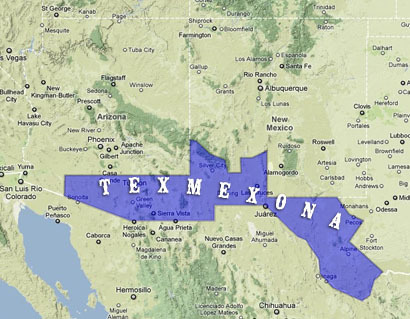 Why not mashup the three state names to create "Texmexona"? A more detailed map here.